Crystal Palace's "pantomime villain" Christian Benteke has apologised to manager Roy Hodgson and his team-mates for ignoring instructions before missing a stoppage-time penalty against Bournemouth. 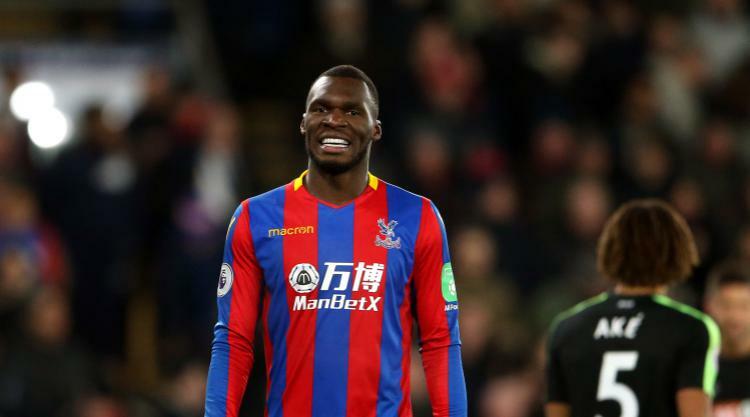 Benteke wrestled the ball off regular penalty taker Luka Milivojevic - who had already converted a first-half spot-kick - only to see his effort saved by Asmir Begovic as Palace drew 2-2. Instead of securing a victory that could have taken Palace out of the Premier League's relegation zone, the 27-year-old striker was booed off by the club's supporters at the final whistle of a match that leaves them bottom. Hodgson revealed Benteke spoke to him on Monday morning before apologising to the Palace squad and the former England manager considers the matter over, even if the Belgian may have to fight to again win over the club's fans. "The first opportunity this morning, he gets the players around, says his piece," said Hodgson. "He's already said it to me - that's a strong and correct thing to do - and he makes it perfectly clear. "'I took this responsibility. I shouldn't have done because I'm breaking ranks, I'm not obeying team instructions, so I apologise for that, but I'm now going to get on with it', and I'm pretty sure he'll make it up to us. "I'm very happy with the way he's reacted to it, the way he's taken responsibility, the way he's explained that to the rest of the team, not just to myself. "He's had the courage to talk in front of the team and explain his decision and apologise for not following the instructions. "I'm happy with that, but I'm never happy when very clear instructions like that are given, and everyone knows they are there to be followed. "There's no one more acutely aware of that than the player who's made (the mistake). Sometimes you don't even need to mention it. What's the point of kicking someone when they're lying on the ground? "What you hope for, when something like this happens, is that the player concerned does exactly what Benteke has done at the first real opportunity, which wasn't in the dressing room after the game." Palace host Watford on Tuesday, when they will be without the injured Mamadou Sakho - who Hodgson says will be out with a calf injury for "weeks, not days" - but will have Yohan Cabaye available. And Hodgson will persist in selecting Benteke. "He played very well," Hodgson said. "Let's not forget that. At the moment Benteke, as far as everyone's concerned, is some sort of pantomime villain. 'The fans have turned against him'. "He's a bit of a pantomime villain, there's no question of that, but that's also a bit unfair if you look at his performance, because it was really very good."